K and I spent a lot of time talking about her birthday party theme. It’s now a process of finding something she likes that works for me, too. She’d talked about doing a party at the nearby inflatable place, for example. I don’t have a real problem with that, but I figure we’ll end up going there a few times with other birthday kids and she’ll get her fill, and she also didn’t make a big deal about it. If she’d petitioned strongly for it over a length of time, I’d go with it. It’s her party and all. 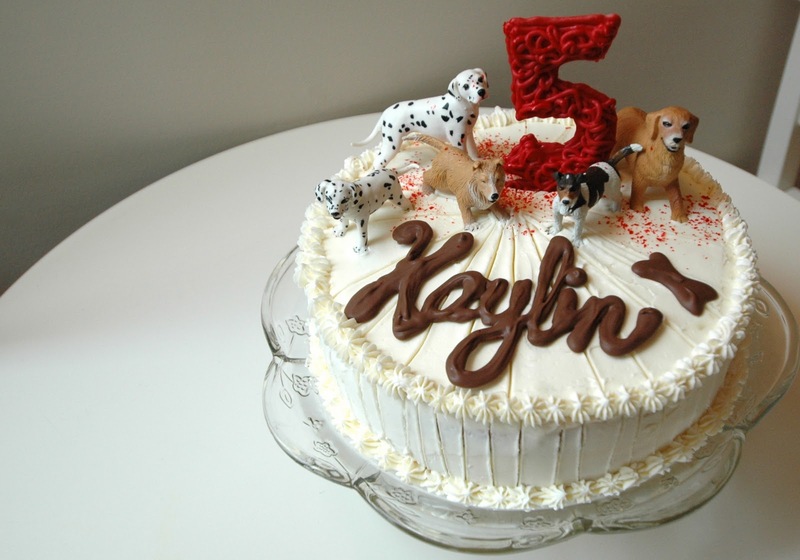 But one of her ideas for this year was a puppy party. Since I already had puppies on the brain related to another project, it was a theme I could jump into pretty easily. And she really is a puppy nut. Her teachers at school suggested that she may replace Cesar Milan one day. She’s always the kid that wants to run around the classroom on all fours sticking out her tongue and wagging her behind. So a puppy party it would be. 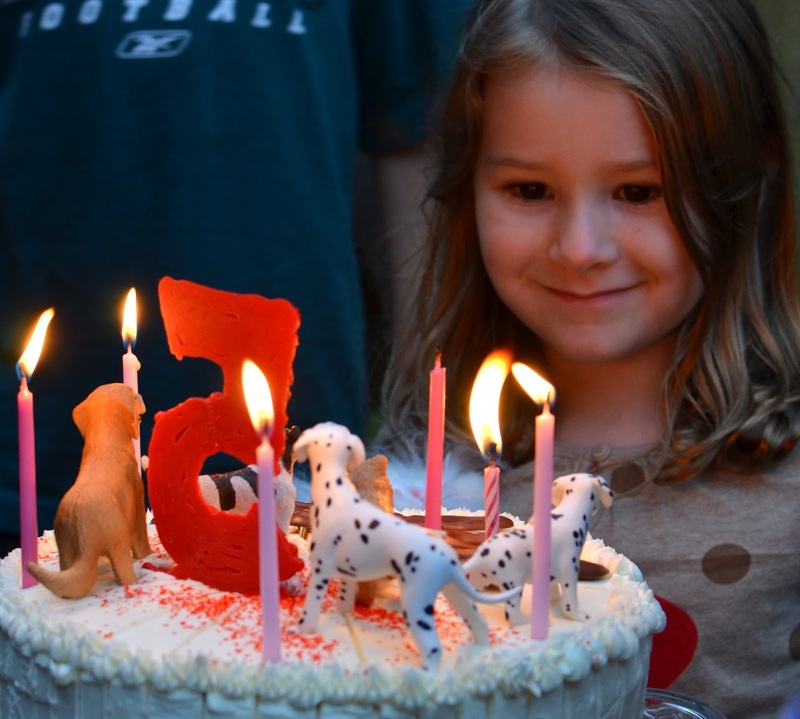 Since her dad had just made his safe return from a year away, and since the invitees for a party for each of them would be 95% the same, we made it a combo birthday/welcome home party. For the party I made puppy ears for the kids to wear. I used this tutorial. To make the invite, I took a photo of K and uploaded it to Picnik. I added the face paint in Picnik! I love that feature! Especially since I hadn’t bought the face paint for the party yet. After adding the face paint, I framed the photo several times with the “border” frame and each time I increased the caption height to make myself a spot to put the invite text. Easy peasy. I could have printed it for snail mailing, but because I’m lazy efficient I e-mailed it out. 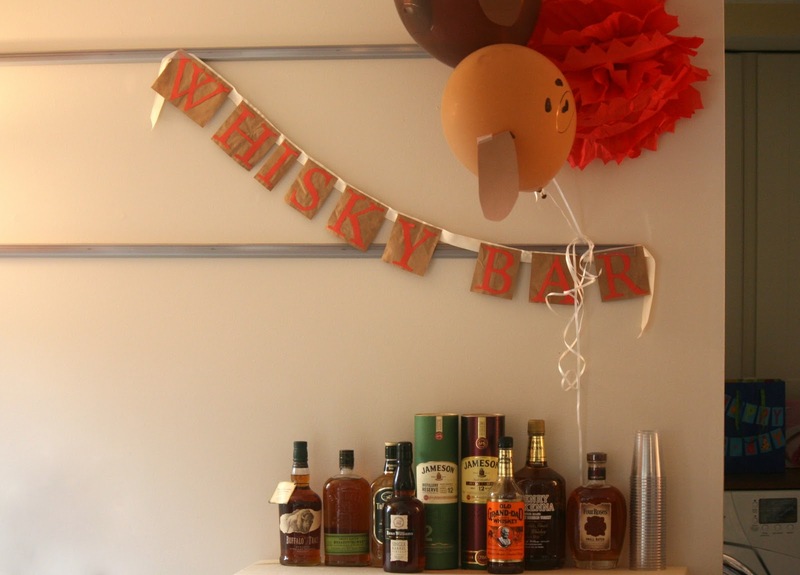 The party decor was fairly simple. 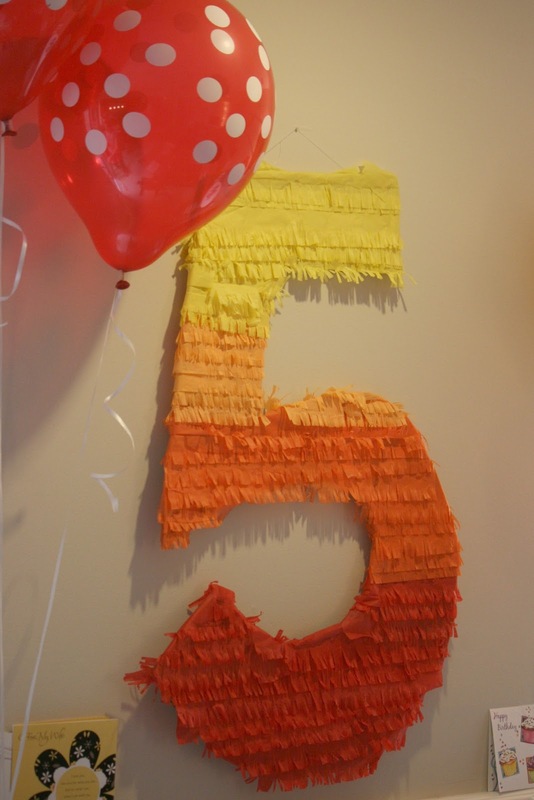 The most complicated part was the “5”. I saw a homemade pinata here and thought I’d go with a non-pinata version. Super simple. Cardboard base. Fringed tissue glued on. I made a whole lot of these balloons that I’ve already blogged about here. 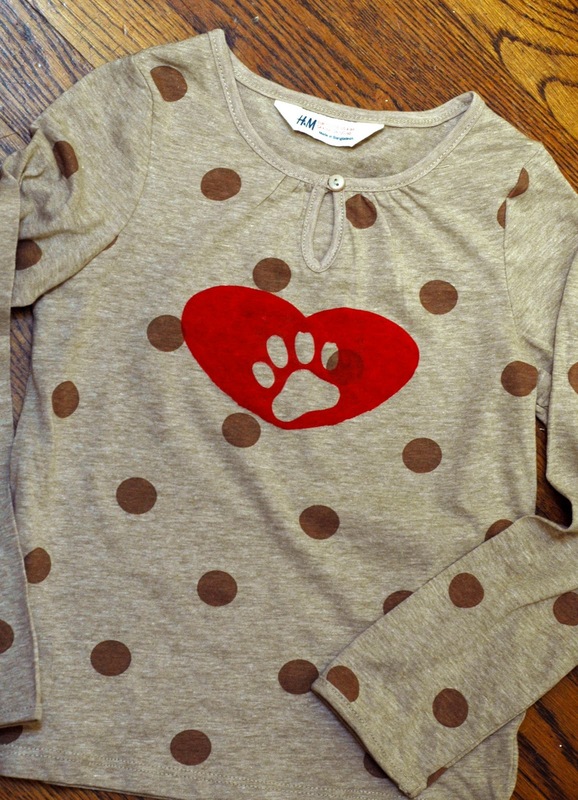 K’s shirt for the party was just a comfy knit tee from H & M. I freezer paper stenciled a heart with a paw print in the middle. She’s not a party dress kind of girl. Generally, when K knows people are looking at her she does anything but smile. I knew she liked the cake and had not noticed people were looking at her because she was actually smiling. She smiles a lot, just not when a bunch of people are looking at her. 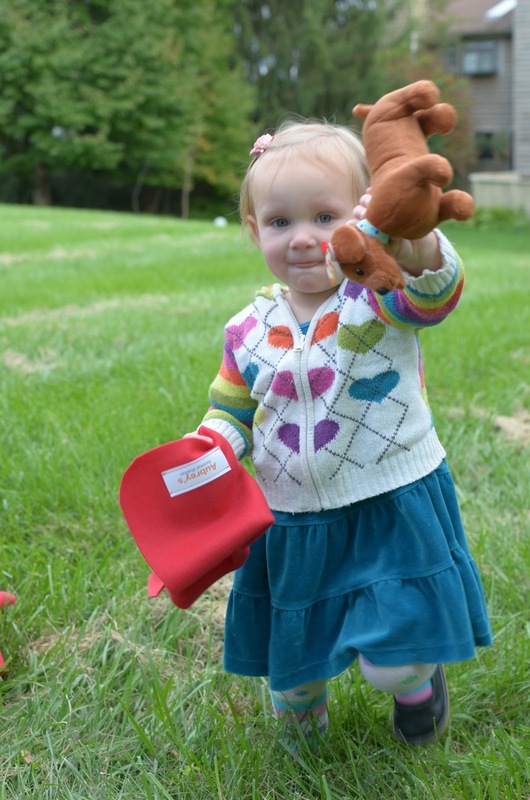 The party favor became part of the party entertainment. I’m not one to try to scream for kids to follow game instructions, so this is as close as I get to that sort of thing. I sent my husband and a friend up onto the giant hill behind our house to chase a bunch of puppies* around. They then called me and I put the phone on speaker so that the kids could hear them. While one was barking and yapping, the other said “Susan! I need the kids to come and help! There are all of these puppies lost on the hill and we need to rescue them! Please send the kids to help!” Each kid got their own “rescue blanket” to take with them to go and pick a puppy to rescue. *All of the parents were grateful that these puppies aren’t the kind that eat or poop. 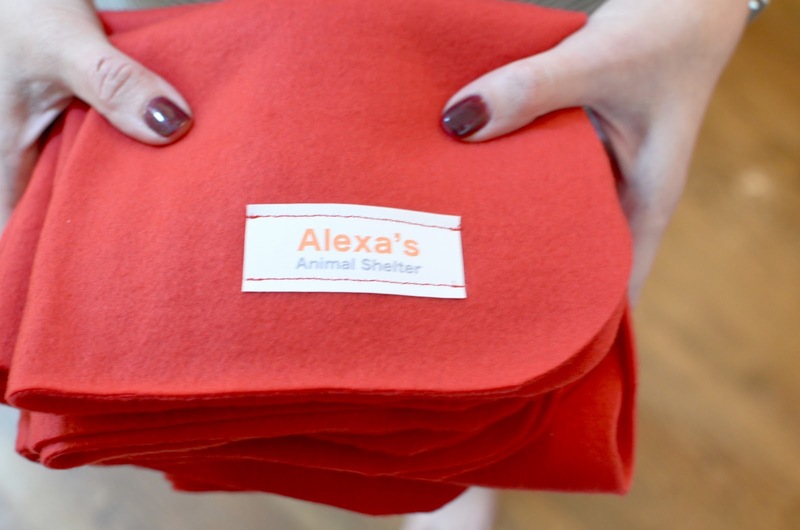 Each “rescue blanket” had the name of the rescuer sewn on. Toward the end of the party I pulled out the face paint. I used this palette and liked the result because it dried quickly, didn’t rub off easily and still washed off well at the end of the night. I loved getting so many colors in one kit. A little goes a long way and even after dong the party and several baboon faces I have enough left for lots more. I asked M whether she wanted a tongue. She must’ve misheard me. Related to the face painting, I practiced my puppy face beforehand and told the kids “puppy faces are all I know how to do” lest they assume I can whip out a Spider Man or something. Puppy faces. That’s it for today, folks. The menu, other than cake? I am so not a foodie. I kept it simple. I made a huuuge pot of chili with this recipe and my only edit was adding corn. I didn’t advertise it as such in order to avoid killing appetites but I thought of it first because chili looks a lot like dog food to me. I cut tortillas into bone shapes to make pizzas. Hot dogs. Spicy drumsticks. We also had spanikopita and chips and salsa and veggies and hummus and cake and… whiskey. (Whiskey, not whisky.) I’d bought Scooby graham crackers and totally forgot to put them out. Finally, these were some of the big-hit birthday gifts. 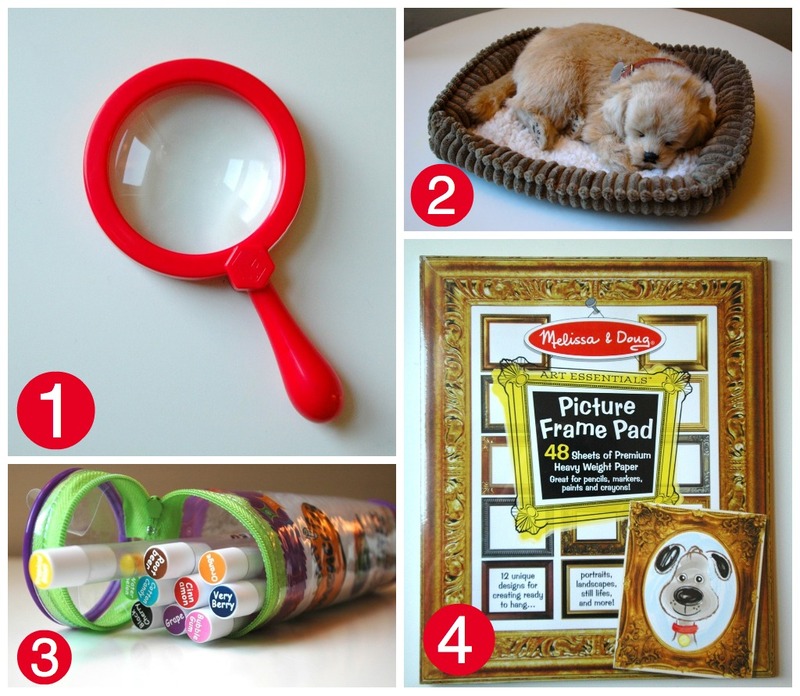 In case you’re shopping for a curious, creative, puppy-loving 5 year old? At the end of the day, this was my favorite photo. We’d finally figured out how and where to put up K’s favorite swing that she hadn’t seen since we’d moved the year before. Oy. Loved the party. So cute and everything looks doable. 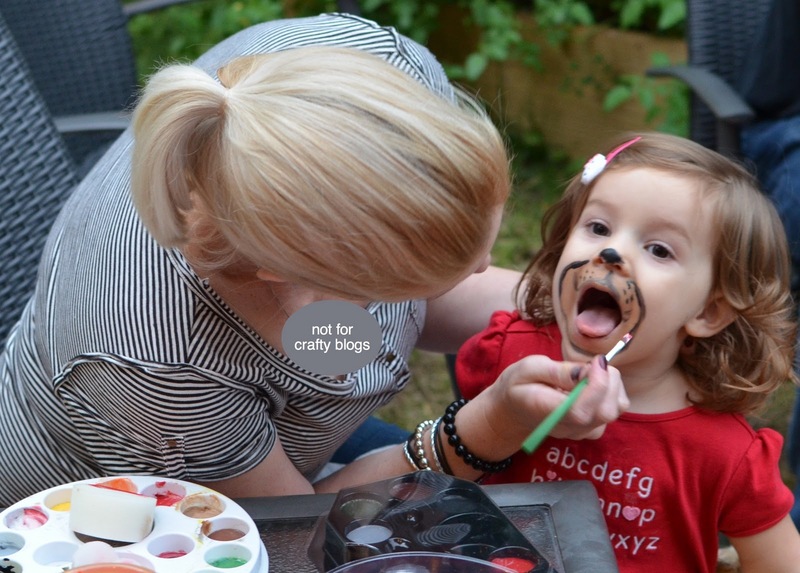 I have to say what got me to leave a comment was your “modesty oval” in the face painting picture. I seriously got the giggles over that. Hilarious! Do you have any pictures of your dog bone tortilla pizza? Or can you tell me what you put on it? I have never made a pizza with a tortilla before. What a fun party! You kill me with your candy melt description, clever photo edits, and description of chili. what a fun party! i love the tissue-fringe 5! Adorable! And what great tips!! I even love the top gifts round-up, excellent. And what beautiful little puppies you have!! I absolutely love the puppy rescue game – very clever!!!! Good job! Maybe you want to cover up the name on the cake. Just wanted to let you know. What a gorgeous party. 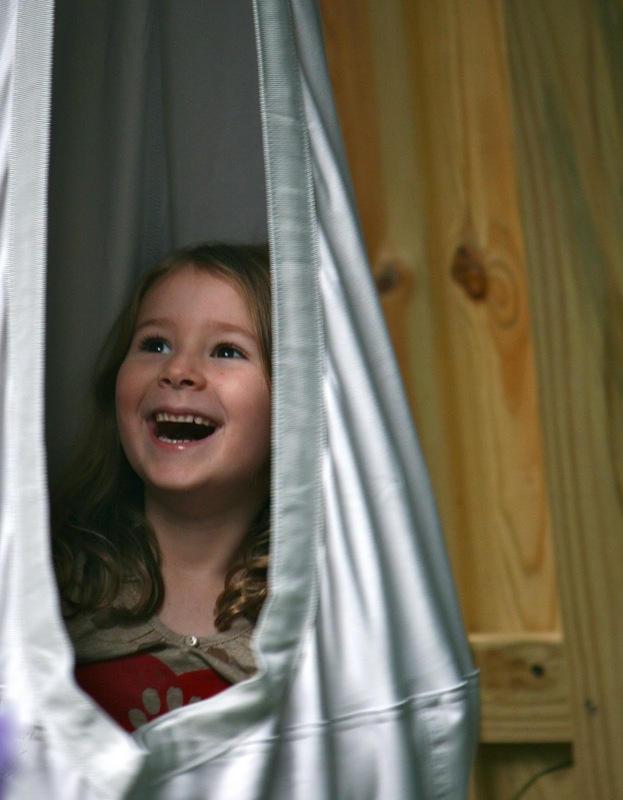 Your Miss 5 looks like she had a fabulous time. I totally respect that you are covering up the names etc for privacy but you missed the cake! Thanks for looking out for me with names. No worries– I’m just trying to keep names out of searchable text. Ashely, I don’t have a photo, but the short answer is that you use one tortilla, two smallish spoonfuls of pasta or pizza sauce and a thin, even coating of cheese plus a thin layer of whatever toppings. Hot oven– 500ish, for three minutes or so. Hahaha.. you cracked me up with you little privacy sticker (not for crafty blogs). 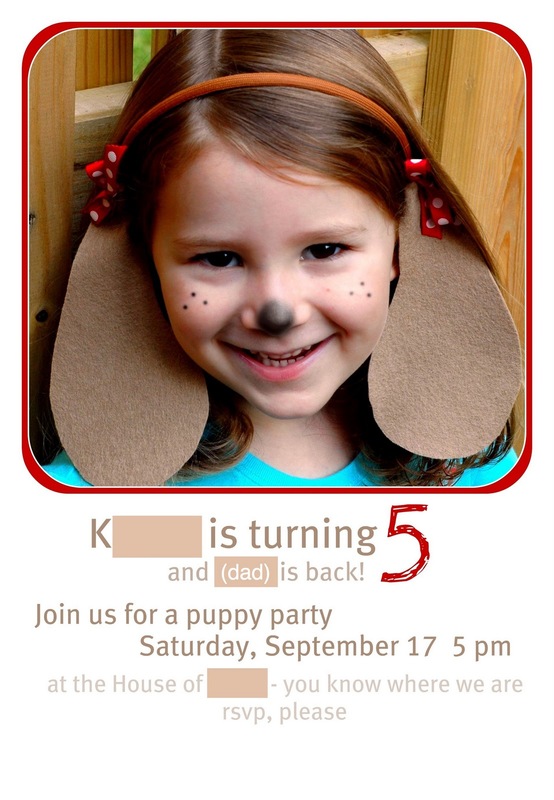 What an adorable party; I’m sure that’s one your daughter will remember for a long long time. Puppy party.. how cute! I would’ve loved a puppy party as a kid. 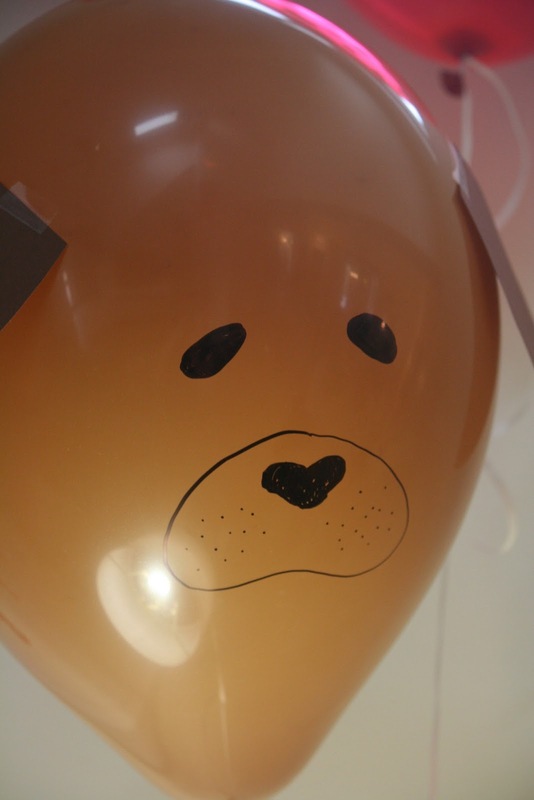 I was a puppy a few Halloweens, and had puppy posters and figurines all over my room. Man, I want to have a puppy party now.